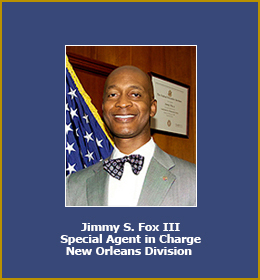 Jimmy Fox III, head of the DEA in New Orleans, is the subject of an internal investigation, the New Orleans Times-Picayune reports. The paper reports he may have violated some ethics laws when he put in a bid to oversee sweeping reforms in the police department that had been ordered under a consent decree with the Justice Department. The paper reported that he may have violated the federal government’s “revolving door” laws that deal with fed officials seeking new jobs. “This matter is currently under internal review and I cannot comment further,” Dawn Dearden, a U.S. Department of Justice spokeswoman, said in a statement published by the paper. The paper reported that last summer Fox launched a businesses, Fox Security Services. He uses his home as the business address. Posted: 1/2/13 at 8:14 AM under News Story.